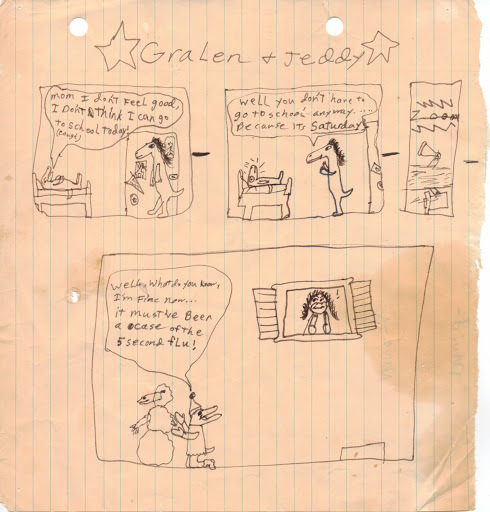 Since it is that time of year, when I look outside and all I see is the ground covered in white stuff(and no, it isn’t mashed potatoes), I thought I would upload a couple of my more “wintery” Gralen And Jeddy comic strips. Yes, apparently it even snows in cartoon land. I guess I would be remiss if I didn’t mention the new characters in the first strip in this post. Somewhere along the way I decided that Gralen should be married and have a child as well, so I brought in Jenny(Gralen’s wife) and their son, Jessy. Don’t ask me where Gralen met Jenny-another talking dinosaur. Maybe Jurassic Park had a singles club, who knows?! This entry was posted in comic strip, dinosaur, fake, gralen and jeddy, jenny, jessy, original, saturday, school, sick, snowman, winter. Bookmark the permalink.